Words are powerful and complex things. They colour the way we see the world. I learnt that lesson many years ago, from a brilliant teacher of linguistics, Randolph Quirk. To illustrate, he demonstrated how words contribute to racism, but could also be used to solve it. The problem, he said, is our use of the words ‘white’ and ‘black’ to distinguish between populations and cultures. Both words carry layers of meaning. White is often associated with purity and goodness – white knight, white wedding, a white lie (= a lie that’s well-intentioned), even White Christmas. But black? Think black magic, blackmail, blacklist, black-hearted. Not a very positive colour, is it? So Professor Quirk’s proposal was that we should re-label ourselves with words that carry less baggage and are a closer approximation to our real skin colour. We wouldn’t be black or white any more. We’d substitute the words pink and brown. What do you think? Could changing the labels help to change attitudes too? I was in discussion on Friday with a group of Salford’s leading dementia service providers, and a question came up that I’ve discussed here before. If there are around 700 people in the city diagnosed with dementia each year, how come so few of them make use of the wide range of services on offer? Go to a dementia cafe or an activity group and it looks reasonably well-attended with 30 or so people, together with their carers. But it’s the same 30 people all the time. Where’s everyone else? I think I know the answer. It’s the same reason why Lena and I didn’t show up when Lena was first diagnosed five years ago. We had lots of plans to make the most of our golden years. Joining the Dementia Society was never on the list. It was partly to do with image. All those pictures you always see of frail old people, blank, teetering on the edge of life. That wasn’t us. We were healthy, active, physically fit. What did we have in common with all the people in those photos? How could we possibly relate? But it was the word too. Dementia, and all its associations. Demented = mad. Lena wasn’t mad. Forgetful, yes. Unfocused, also. Unable to find her way from our house to the newsagent a couple of blocks away – that was true too, even by the time she was diagnosed. But mad? Absolutely not. Even to suggest that was demeaning. 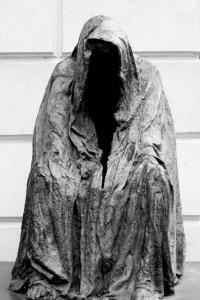 Dementors are among the foulest creatures that walk this earth. They infest the darkest, filthiest places, they glory in decay and despair, they drain peace, hope, and happiness out of the air around them. It’s a brilliant personification of dementia, of course, but you wouldn’t want to hang out with these guys, would you? We need a better word for ‘dementia’ – one that doesn’t scare us all away. In my Carer Tips newsletter last week on the use of photographs in dementia care, I talked about Timeslips, a project that helps people with mid-stage dementia and beyond to hang on to their communication skills. While I was researching Timeslips, I came across an inspirational research paper from the project-designer, Anne Davis Basting. As I was reading I noticed that Anne frequently used the acronym ADRD – standing for ‘Alzheimer’s disease and related dementia’ – instead of ‘dementia’. Checking with Google, I find it’s a term others use too, although I’d never come across it before. Could this be the answer? It’s free from connotation. But it’s not particularly memorable. Changing everyone’s perception of dementia isn’t only about the words we use, any more than ‘pink’ and ‘brown’ will solve all the problems of racism. We also need to tell stories and show pictures that cast the illness in a more positive light. I’m trying to do just that here on the site. I believe that some of the activities we’re proposing for the Bine will help too: if people with dementia work alongside teams of people on community volunteer projects, we’ll take dementia out of the ghetto – normalise it. But if we could just think of a less scary, less negative word! Brainwave, anyone? The Missing - where are all the people who have been diagnosed? How we're planning to change dementia care. Then don't miss a post. Our weekly Monday newsletter includes a digest of all the week's articles.